The official theatrical release date for the highly anticipated sequel, Incredibles 2 is mere months away but the excitement surrounding the film is everpresent with fans clamoring over any bit of news they can get their hands on. If you recall, back in mid-November the first official Incredibles 2 teaser was released and it quickly became the most-viewed animation trailer of all time. 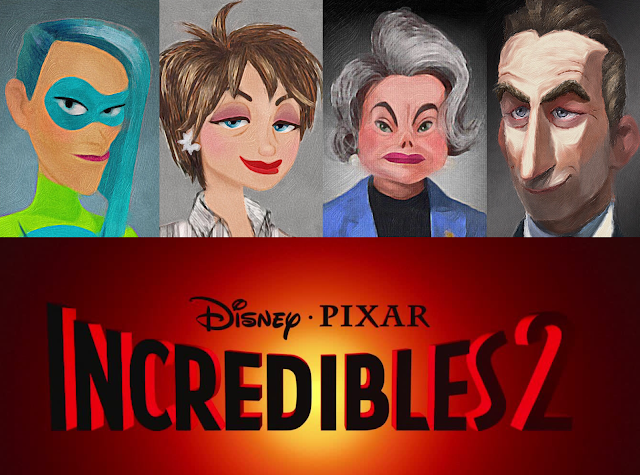 Today, the official Pixar Facebook page revealed four new characters to the film with each photo revealing new and exciting plot and character details. The images were released similar to the viral sensation of the Google Arts and Culture app - which allows users to find their doppelganger amoungst portraits from various museums around the world. 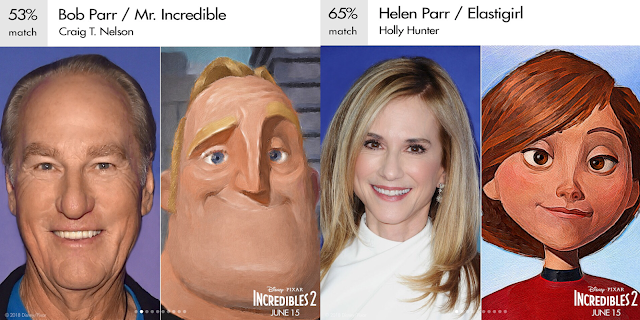 Everyone’s favorite family of superheroes is back in “Incredibles 2” – but this time Helen (voice of Holly Hunter) is in the spotlight, leaving Bob (voice of Craig T. Nelson) at home with Violet (voice of Sarah Vowell) and Dash (voice of Huck Milner) to navigate the day-to-day heroics of “normal” life. It’s a tough transistion for everyone, made tougher by the fact that the family is still unaware of baby Jack-Jack’s emerging superpowers. When a new villain hatches a brilliant and dangerous plot, the family and Frozone (voice of Samuel L. Jackson) must find a way to work together again—which is easier said than done, even when they’re all Incredible. Directed by Brad Bird (“Iron Giant,” “The Incredibles”) and produced by John Walker (“The Incredibles”) and Nicole Grindle (“Sanjay’s Super Team” short, “Toy Story 3” associate producer), “Incredibles 2” busts into theaters on June 15, 2018. We are beyond thrilled to learn about these additional details surrounding the new cast of characters. Back in December, it was revealed that Catherine Keener and Bob Odenkirk were attached to the film, however, it wasn't confirmed - until today. What are your thoughts on the updated cast of characters? Share your thoughts with other Pixar fans in the comments below or in the Pixar Post Forum. Meet four of the new characters for Incredibles 2 and learn exciting plot and character details.